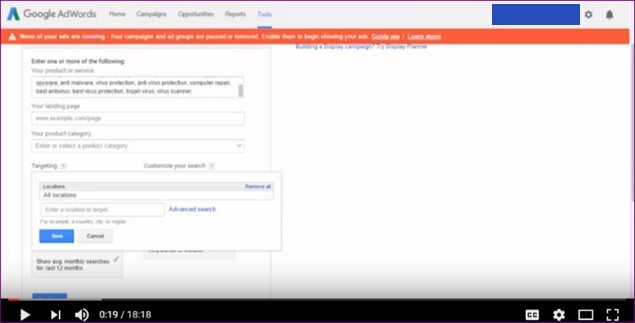 This video is about “How to Use the Google Keyword Planner Tool” which is listed under the tools tab. For this tutorial, I’ll use a computer repair business in Melbourne as the example. I’ve already typed in the words that I want to look for, I’m not talking about the landing page or product category at the moment, I just want to look at the search results of the Keywords I have selected. 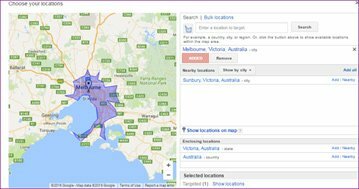 This is targeting your location and what I want to do is target Melbourne Victoria and you can put in as many locations as you like. I just want to show you something in here. If I just scroll over nearby, this is the region that is listing. As you can see, this is the area that is going to cover in Melbourne. Now what I think in that area, there’s probably a population, there’s probably three and a half million people in this region in here just to give you an idea. It’s already suggesting nearby as Geelong, but let’s just keep it simple and just target Melbourne and click “Save”. In the targeting section it defaults to Google, what I like to do is edit this and choose and save Google and search partners what this means is Google Search Partners like, YouTube, Google Local, Google Plus, will show up in the average monthly searches for 12 months. Plus I like to edit “Keyword Options” and turn ON “Only show ideas closely related to my search terms” option. Or you can tailor, but I just like to have it as just the last 12 months is sufficient. Then hit save. Now, let’s click “Get Ideas”. Just ignore the chart above for now. The one I want to go to is just a bit further down. 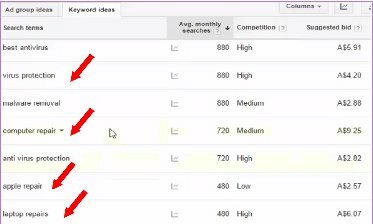 Google defaults to “Ad group ideas” because they’re selling ads with these keywords but I just want to have a look at keywords in “Keywords Ideas” tab and these keywords are the ones that I’ve typed in earlier. Now, this search is for a computer repair business, so we’ve looked at the different keywords of what they would want that are relevant to their business. The reason why the Google Keyword Tool is so powerful is because we can find out what people are searching for. So before you even start going online, don’t second guess. Let’s do this with a bit of science and accuracy. These keywords aren’t in order, but if I click “Avg. 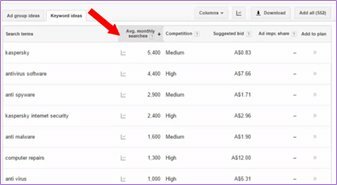 monthly searches”, what this will do for me is that, it sorts the keywords from highest to lowest Average Monthly Searches. The interesting thing is we want to search Kaspersky. Now that’s fairly generic in that term but there are 5400 searches and a medium competition here means there’s not a lot of people competing for the ad but the suggested bid for the ad is A$0.83. I’m primarily doing this to find out the result for the Google search results. Let’s just come down the page a little bit. Now this business is a computer repair business so we’re chasing the keyword “computer repairs”. This is what we want to find out. So here in Melbourne, on average, there’s 1300 people every month typing computer repairs. Now the interesting thing is, with the search terms is that these people are coming online with a problem and looking for answers. So this is important part to understand with your search terms in the internet. Your buyer or reader is coming to browse, compare and then buy by using the internet like it was with the yellow pages. You didn’t pick it up to rate it as a novel, you picked it to buy something and you started to browse through and look at all the people and you started to get on the phone to ring them. Well the internet is now the new way to do this. 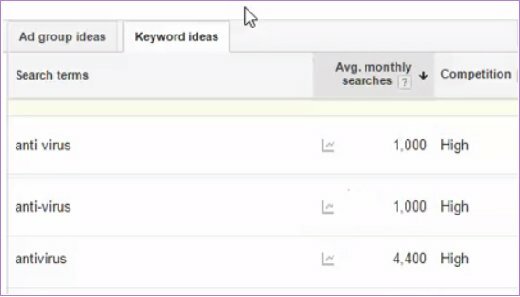 So when you start your marketing strategy, this tool is absolutely fantastic because you can make sure that these search terms are the ones used by your target audience. You get the right search terms to make sure that when someone does type these words in they match the search terms in your website, your meta descriptions, title tags, etc., all match up to these keywords or search terms that your potential buyer is typing into Google. OK, so let’s look at this with computer repairs. 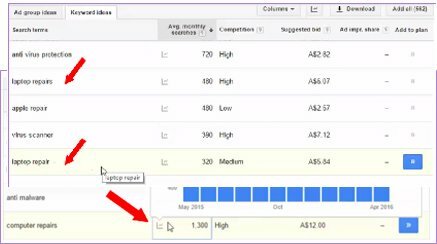 So if we hover in this section, this pop-up box appears and then you’ll see the monthly search stats during the 12-month period. 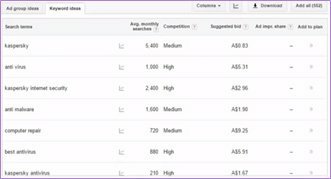 Now, in Adwords campaign, you can see that this keyword is pretty competitive and there’s $12 per bid on that. Let’s have a look at some of the other keywords. “Virus protection” is 880 searches per month. For “Malware removal” there’s 880 searches per month, “computer repair” is 720. Now we had computer repairs as in plural with 1300 searches. “Apple repair” not a whole lot in there, 480 per month. “Laptop repairs” you can see there is 480. We haven’t included “laptop repair” yet in our keyword list so here’s an interesting exercise. Let’s go to the list of keywords above and let’s type in here “laptop repair” then comma and space. Click “Get Ideas” and we’ll just see how this one comes up. Now, let’s look at the difference between singular and plural keywords – say “laptop repairs” was 480 and “laptop repair” was 320. It’s always advisable to do both the singular and the plural because you could just never guess just which way they can go. Sometimes, keywords could be spelt wrong, e.g. “antivirus” vs “anti-virus” with a dash and “anti-virus” with a space. “Antivirus” is 4400, “anti-virus” is 1000 and “anti-virus” is 1000. Let’s have a look at the keyword antivirus software. This chart shows there is almost 0 searches from May 2015 up to December 2015 and then has dramatically increased starting January 2016. So you might not see it from the screenshot but there’s 8,100 searches in January 2016, there’s 12,100 searches in February 2016 and then there’s 14,800 searches in March 2016. You can see “antivirus software” is the biggie, the real hot one at the moment. So if you’re building your website or whatever you’re doing with online, you’d certainly want to talk about “antivirus software” and make sure it is in your list of keywords. 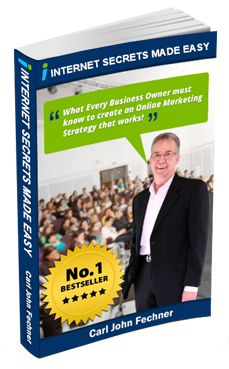 Now, the next thing is to download the keywords that you need. It’s as simple as going down and ticking these boxes. We are ticking the keywords that we want to use. These keywords are the keywords that you need to have in your website, in your content and on your other on-pages elements that need keywords. Ignore the “Bid range” section for now. It is located at the right section of the keyword ideas. 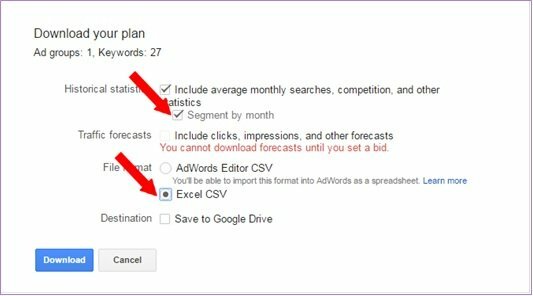 If you’re planning on advertising using Google Adwords, then you’ll use this option but that’s not what we want to do in this tutorial. and now we’ve got this pop up. When you download your plan, make sure you segment by months. Now, tick on Excel CSV and start downloading the file and save the file to your computer. Now, when I open the downloaded spreadsheet, I’ve got all the keywords I chose. There’s the Keyword Type, Avg. Monthly Searches, Competition, etc. Across the pages is your months. I can see the “biggie” keyword, the month it has climbed up and all the other stats for this specific keyword. So on that search term, that’s hot property right now. Now, the next thing to do is save it as an Excel worksheet. You can save it to what you want but this is how I do it. This is one of things that we do for our clients when creating their digital marketing strategy. With these figures, you know what terms you need in your website, in your content, your title tags, in your meta descriptions, your h1, headings, your content on your pages and the list goes on and on. If you do this before you begin to develop your online presence, it will help you to build a very successful online business. I certainly hope that has helped and we can do for this you.